Well here’s a swift follow-up to the excellent launch of Planetary Assault, the anthology that contains First Conquest: Stellar Conquest Book 1. 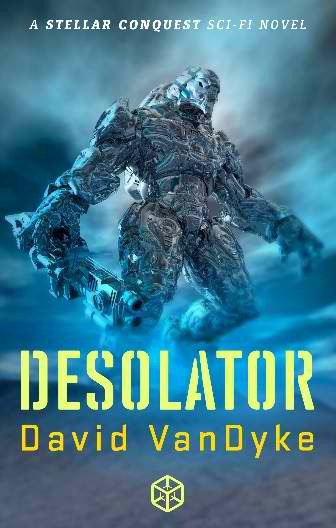 It’s called Desolator: Stellar Conquest Book 2. I wrote it immediately after book 1, with all the enthusiasm of a new creation, and I really think it’s even better than my average so far – which is still pretty good. If you like combat/military science fiction, with warships, space marines, aliens creepy and conventional, and more Henrich Absen, Jill Repeth, Rick Johnstone, Bull ben Tauros and Spooky Nguyen, you’ll be happy with this new book. Planetary Assault has been doing well, staying consistently in the 2000-3000 range of Amazon books overall, and sitting solidly on several Top 100 lists, thanks to the pull of the other two authors and, dare I say it, me too, and is picking up good reviews. Speaking of reviews, if you can commit to reviewing any of my work, I’ll be happy to give you an ebook copy for free. In other news, I am well along on Comes The Destroyer, Plague Wars Book 5, which should come out in July sometime. I also have a novella in the works, titled Reaper’s Run, which will tell the story of Sergeant Jill “Reaper” Repeth as she escapes across an apocalyptic America immediately after the Eden Plague is loosed on the world. Chronologically it will fit between the Eden Plague: Book 1 and the Demon Plagues: Book 2. Call it a 1.5. Cheers, and have a great reading summer! Congrats on the new release. Cover is great! Thank you, ma’am. I can only claim I selected and bought it; James at Humblenations.com did it. Cheers! Nice one, David – great cover too. Having read both, I can highly recommend these books to anyone looking for some tightly-paced sci-fi. And good luck with Eden Plague 5! Thanks, Nick! Keep an eye out for a post (well, more than one, but it’s basically the same post) on the KDP boards, that keeps getting moderated for no reason that I can see. Bottom line, the anthology thing has resulted in a measurable increase in sales as the other guys and I cross-connect our fans. Cheers!